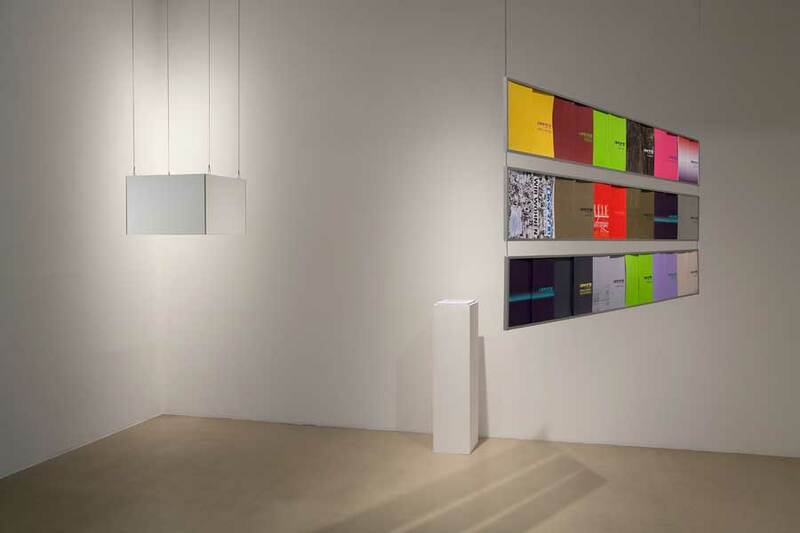 The installation „Textsythese III“ is based on the exhibition catalogues produced by the Kunstraum Niederöstrreich. One sentence/phrase from each catalogue was chosen and marked by putting a red ring round. 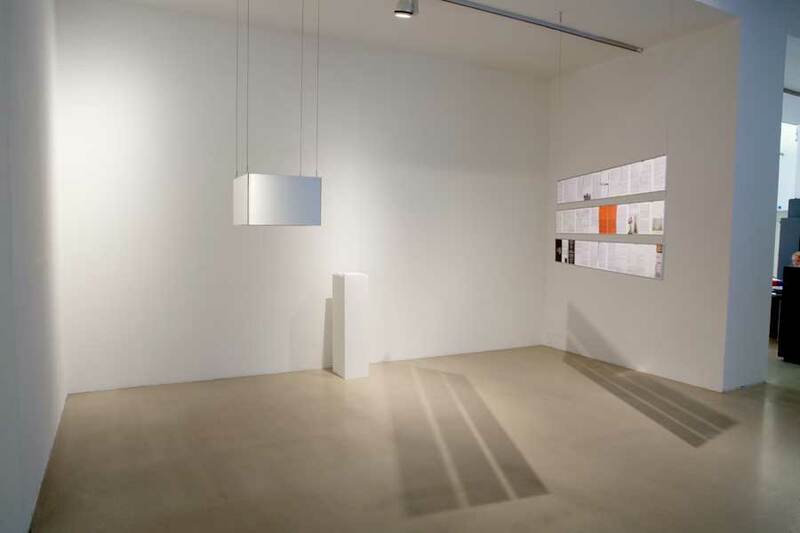 The open catalogues then were placed in a display, which was hanging from the ceiling, and arranged in a way that the selected sentences/phrases were forming a text of its own. Opposite of the display a cube made out of mirrors was placed kind of floating in the room. Both, the inside and the outside is made of mirrors, but it is open on the bottom and on the top. The viewer can “enter” the cube. 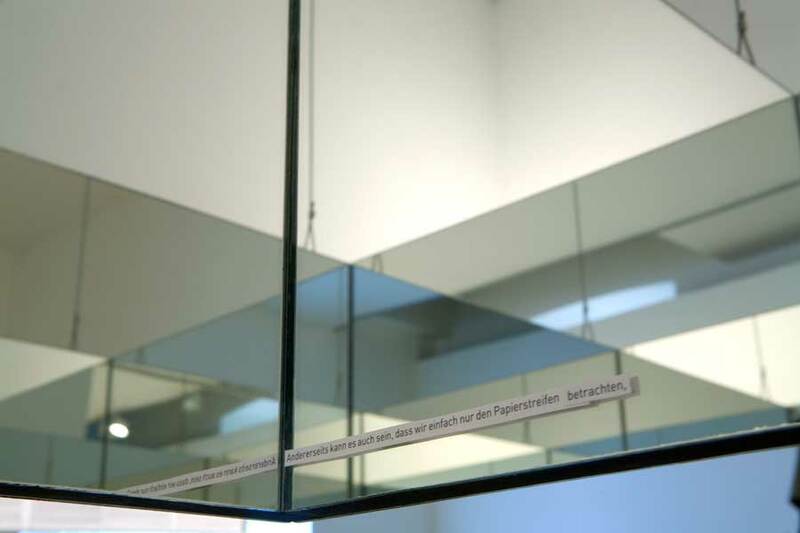 Since it is positioned about in the same height as the head of the viewer, he/she sees his/her reflection as well as the indirect reflection of the surrounding room. 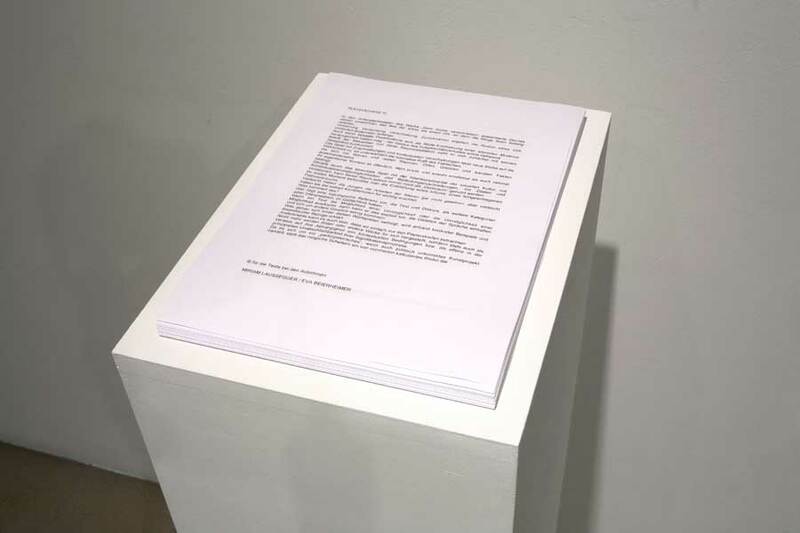 Since the object refers to the text this work inverts the conventional way of translation from the piece of art to the text relating to the work. In this way it questions the relationship between art and its description. In the opening passages of „Archive Fever“, Derrida presented his audience with the image of the arkhe, as a place where things begin. Distortion, contraction retraction, diversion, withdrawal make up the illusion of an ever-changing beginning. Even though aforementioned post-modernism might have turned out to bet he fashionable appearance of an ageing modernism – the gestus of the loss of subjectivity seemed to provide relief. 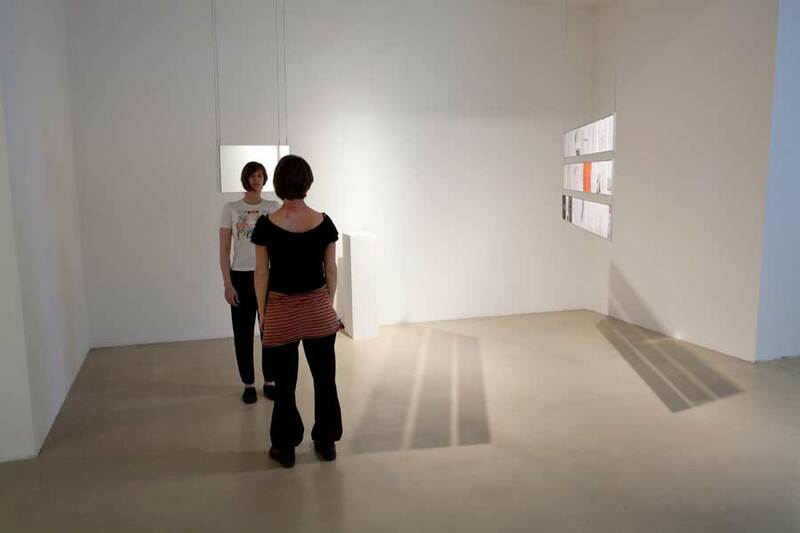 When the viewers enter the installation they first see themselves confronted with their own reflection. 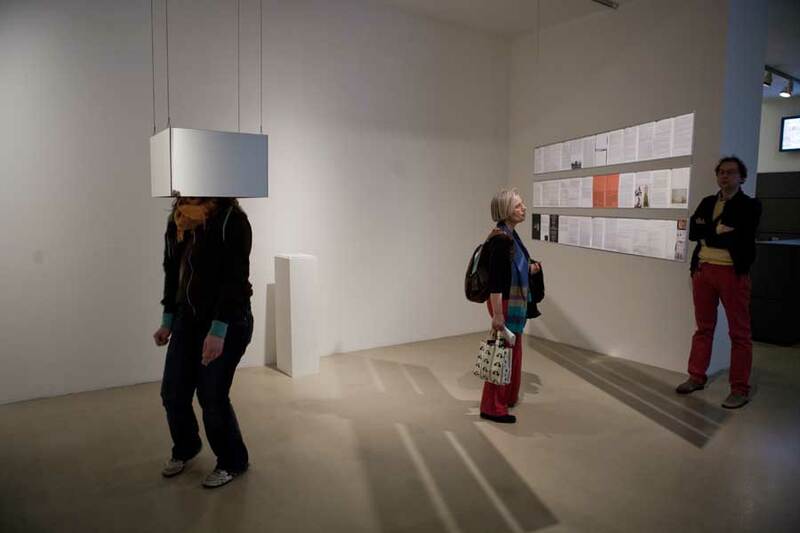 which examines fictive and real spaces, sites, borders and banal facts. Its intrinsic context is a public, not a private one, and based on both en emotional and also rational point of departure. Precisely because of the conscious play found in an interdisciplinary use of visual culture, with all the possibilities of contextualization and attributions of meaning, with of citations and imitations, this space can nevertheless still be used as an „imaginative space“. At first, one fears the exposure of an error, a failed attempt at pathos. Perhaps the younger artists have not even seen the works of the elders; but perhaps they have admired these very artists considered important. What we have on hand here is a topological reference, which is retained in the memory of both text and discourse as further categories of interpretation. If a text expresses the possibility of an impossibility or the impossibility of a possibility then it can do so explicitly, keeping the rules of language and concerning itself little with other rules. What exactly is hidden behind this play on words is explained using concrete examples and theoretical references. Images or other works of art are no longer produced for themselves alone, rather constantly a proof of their dependence on contextual conditions, or as open to the principle of their never-ending processes of signification. 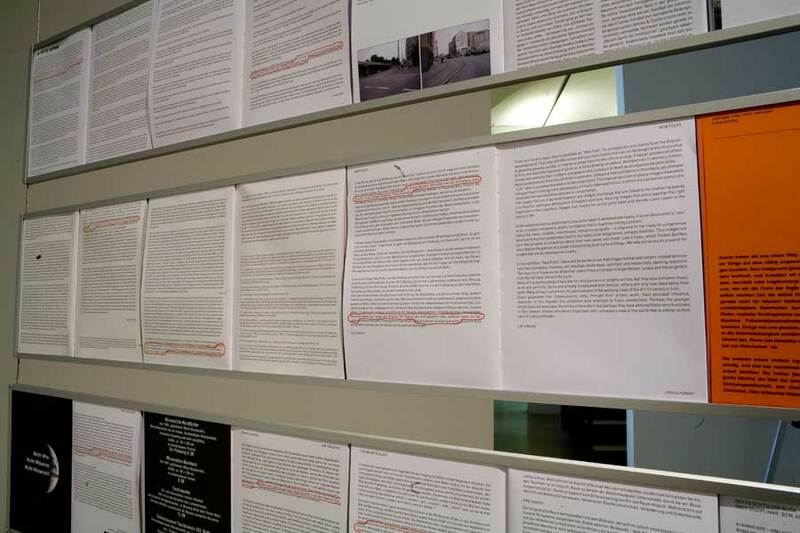 Since the exercise involves a ”participatory”, albeit politically incorrect art project, its possible failure represents a calculated risk taken into account from outset.